This shows the centre of the Milky Way as seen from Australia. 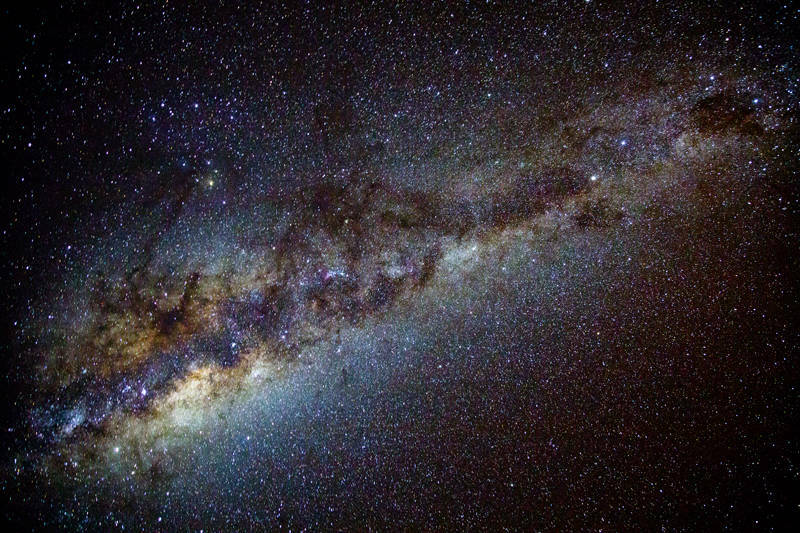 The Southern hemisphere has a great view as it faces the bright heart of our galaxy. On a clear night, you can read your watch with nothing but starlight. With this overabundance of reference points, the ancient aboriginal astronomers mapped the sky by creating shapes from the gaps between the stars instead of joining the dots into constellations. The body of a giant emu is formed from the dark clouds of dust in front of the luminous galactic centre and the head of the emu is the coal sack next to the Southern Cross. Seasonal events such as collecting emu eggs were measured by its movement throughout the year. I have been travelling through Queensland’s coal country since leaving the coast. I did some research in a local pub and was told by two mine subcontractors it is easier to get into prison than a mine. This was proved earlier today when I had to call a dozen people just to get approval to drive past a mine. Fortunately, I have arranged a tour of two Blackwater mines on the 10th-11th of July. After that, I will visit a number of mine viewing platforms in surrounding area where I hope to recreate the success of this shot before returning to Mackay for QME on 24th-26th July where I plan to make some more contacts.